Blood pressure monitors measure the force of blood pushing against artery walls. To get a better overall look at patient health, many doctors recommend patients with high blood pressure, diabetes, or pregnant women with pre-eclampsia monitor their blood pressure at home. Today’s technology has made blood pressure monitors easy and convenient to use. Our team did extensive research to find the monitors that have the best mix of accuracy, fit, and convenience. We’ve reviewed automatic, manual, and wireless monitors to help you find the right model for your needs. For each of our picks, we’ve provided information about accuracy and key features like wireless control, cuff fit and battery life. Read more about our methodology. Consistently accurate results and good design make this blood pressure monitor one of the best on the market. The adjustable cuff is easy to use without assistance. A large, easy to read display rounds out the top features of this dependable monitor. A good basic blood pressure monitor that’s easy to use and gives the accurate, consistent results you’ll need to track your health. One touch operation leaves little room for error, making it simple for those who don’t want to mess around with extra options. This monitor has consistent accuracy at an affordable price. It includes a list of features such as two user tracking, date and time stamp on each reading, and portability that make it a great value. An excellent monitor for homes with multiple users, this monitor makes it easy to manage readings long term. It also includes colored indicator lights let you know if your blood pressure is at a dangerous level. An easy to read, backlit display and one touch use make this monitor a user favorite. The Omron 10 can average results for you and includes an impressive amount of memory so you don’t have to write down results. This compact, wrist cuff blood pressure monitor has the portability to be used while traveling or kept in a purse or bag to be used throughout the day. Readings are accurate, fast, and easy to get. The backlit display can be seen even in dim lighting. This wireless monitor syncs to a free app provided by the manufacturer. You can easily access results and see them displayed in graphs and charts that show patterns in blood pressure. Easy to setup and ready to take readings right out of the box, this blood pressure monitor doesn’t waste time. An easily positioned arm cuff helps you get accurate readings with every use. 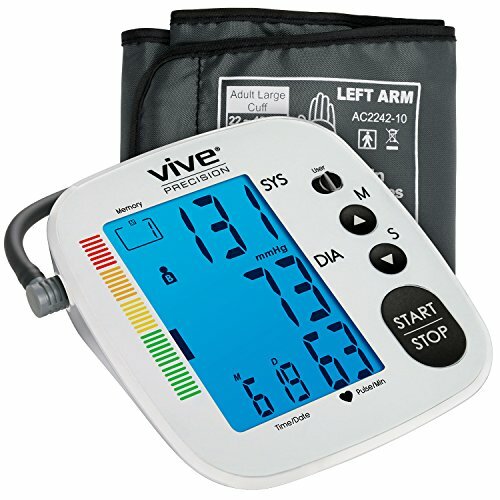 This reasonably priced manual blood pressure monitor offers durable build and consistent accuracy. An easily adjustable arm cuff can be ordered in different sizes. It comes with a convenient carrying case and place for ID information. Accuracy could be the single most important factor when choosing a blood pressure monitor. A good home blood pressure monitor should give comparable results to those taken at a doctor's office, though some variation should be expected. Blood pressure changes throughout the day, movement, meals, and emotions can affect results. That is why it’s best to average several readings throughout the day to get a good overall picture of health. Measure the circumference of your upper arm to be sure that the cuff included with the blood pressure monitor will fit correctly. An ill-fitting cuff will not give an accurate blood pressure reading. Some models come with more than one size cuff while others require you to pick the right size when purchasing. Many models come with an adjustable cuff but even then, you’ll need to be sure it fits your arm. Wrist cuffs are much easier to fit as there is not as much variation in wrist size. Blood pressure monitors vary greatly in the features they offer and some are easier to use than others. Manual blood pressure monitors provide the most accurate readings but may be difficult for some people to use on their own. They also require knowing how to read the dials and record heartbeat. 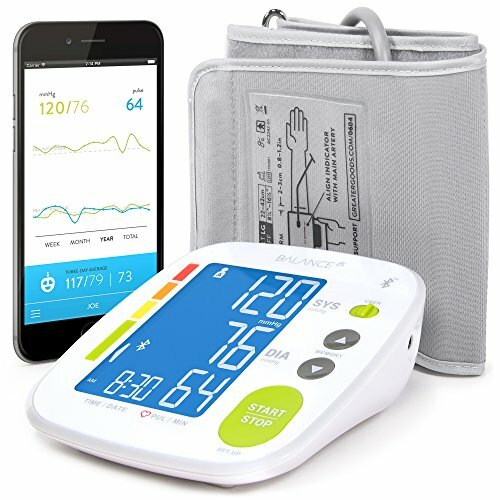 Wireless blood pressure monitors connect directly to a wireless device like a smartphone or iPad but do require some technical know-how to get set up. Touchscreen technology, which some people like, may be difficult for older users. In this case, there are some monitors that have manual switches to turn on the monitor or search through past records. Monitors can be found in the most basic manual monitors to models that can record information in an app and sent to your doctor. For some users, simple is best, but, for those who want a little more, there are a number of features available. A few of the most useful extras are multiple user memory, multiple cuffs, memory download capability, irregular heartbeat detector, risk-category indicator, large digit display and data averaging function. If extra features do nothing more than add confusion, stick to something basic with an easy to read display. For $25 and under you can get a basic automatic blood pressure monitor with a wrist or arm cuff and a digital display. 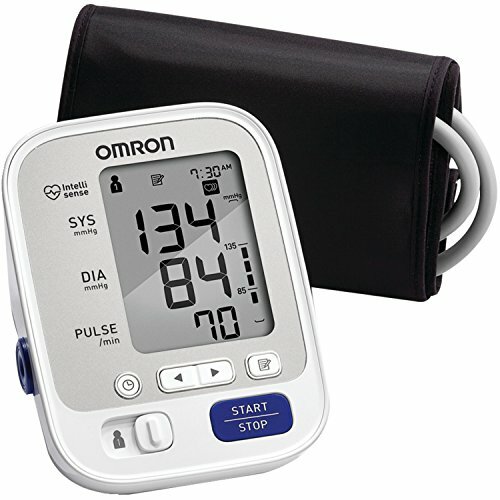 Manual blood pressure monitors, like those found at a doctor’s office, can also be found in this price range. 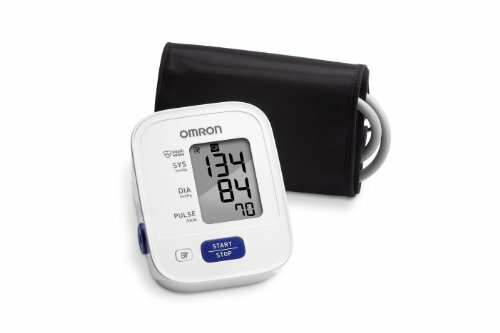 Monitors in this category usually do not have any extra features beyond taking a blood pressure measurement. Accuracy at this price range is hit or miss. Some models, especially manual monitors, perform remarkably well, but a few automatic monitors in this range are notoriously inaccurate. At $25 - $50, you’ll find high-quality, accurate automatic and manual blood pressure monitors. Most of the automatic models have an arm cuff and offer many extra features like multiple user memory, quick pulse detection, and multiple cuffs. 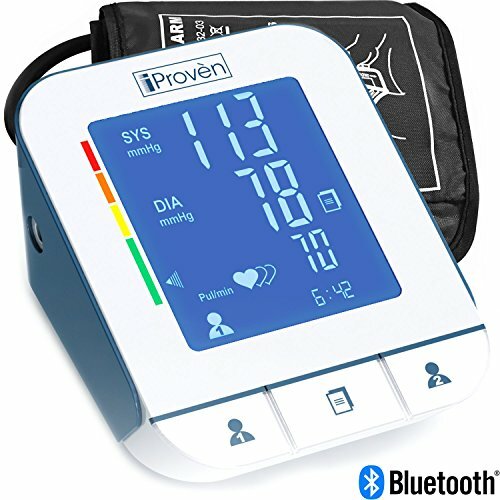 From $50 - $100 are automatic blood pressure monitors with wireless capability. They may come as a kit with two or more cuffs, digital display and/or an app to sync with a smartphone or other wireless device. When it comes to ease of use, it’s hard to beat the Omron 5 Series. This monitor provides accurate results that are consistently reproduced time and time again. The D-ring arm cuff fits arms ranging in size from 9-17 inches and is contoured for a better fit. It’s easy to correctly place without assistance. The large digital display is easy to read. A physical switch is used to change between two users. Older users and those with impaired vision report this switch as one of their favorite features. It detects an irregular heartbeat while in use and compares readings with a standard blood pressure offering a fast comparison. Easy to use D-ring arm cuff. The D-ring arm cuff slips over the arm, making it easy to place correctly for someone taking their blood pressure without help. Large, easy to read display. An easy to read display with large number makes it simple to correctly record blood pressure. Consistent, accurate results. Not only does it give accurate results, it can repeat with the same accuracy time after time. Enhanced memory capacity for long term record keeping. Stores up to 50 readings for two users. That’s 100 readings worth of storage. Extra features worth using. A blood pressure level bar shows how your reading compares to normal blood pressure levels, offering a good frame of reference. Irregular heartbeat detector indicates when more may be wrong that just blood pressure. Arm cuff may need to be replaced. A few users reported that the arm cuff stopped working within a short time period and had to be replaced. Simplicity is this monitor's strength. Many users like the ease with which they can get the D-ring cuff on and arranged. The adjustable cuff fits a wide range of arms, making it usable for most people. It takes an accurate reading with the touch of one button. A high number of users like that there are no menus to scroll through to start taking a reading. It also records up to 14 readings, giving you the chance to take an average blood pressure for a better overall idea of health. Provides accurate readings. Performs with the precision you would expect from Omron, giving accurate readings over and over again. Memory for up to 14 readings. You can track your readings over a short period of time as it records and reviews up to 14 readings. Tracking your average blood pressure gives you a better overall assessment of health. D-ring cuff with contour fits most arms. The D-ring cuff fits arms with a circumference from 9 – 17 inches, which fits most people. It’s easy for the user to place without help. Quick and easy to use. Because there aren’t a lot of extra features, it’s easy to turn on with one touch and take a quick reading. There are no menus to scroll through. A few units stop working after a short time. A few users had their unit stop working after two to four months. This compact monitor provides consistently accurate readings. Many users tested it at their doctor’s office and found the two readings to be similar. It also provides an in-depth view of your health as it marks each recording with the date and time. For greater portability and ease of use, it can be used with either batteries or an AC adapter. Everything included with this monitor—the cuff and adapter—easily fit into a carrying case making it ideal for those who need a monitor with them at all times. For households with more than one user, it can track records for up to two people. Consistent, accurate results with each use. This monitor performs well time and time again, producing results that are close to those at a doctor’s office. Records results and time of day. Recorded results include the date and time, giving you or your physician the opportunity for an in-depth analysis of your blood pressure. Both battery and AC adaptor for power. You can either use the AC adapter or batteries for power which is nice for portability and ease of use. Carrying case keeps everything together. The included carrying case keeps the cuff, monitor, and AC adapter together so you have all the right parts when you need them. Remembers up to two users. Tracks and records for up to two users. Battery life. A few users report that the battery drains quickly even with infrequent use. An easy to read display with a host of useful information sets this monitor apart from others in this price range. The display shows the user, either A or B, battery life, blood pressure, month, day, pulse and the readings it’s recorded. This monitor collects an incredible amount of information for a machine at this price. Add to that the colored indicator lights—green, yellow, orange, and red—that let you know if your blood pressure has entered a dangerous range. Many users report that they could rely on this machine to give them the accurate readings they needed to make informed health decisions. Stores recordings for up to two people. Tracks recordings for two people. It’s easy to switch between the two with the ‘user’ switch. Colored safety indicator lights. Green, yellow, orange, and red indicator lights on the side let you know immediately if your blood pressure is in a dangerous range. Amount of information recorded gives an in-depth picture of health. The date, time and year can be set so that each recording also has this additional information. Setup must be done correctly for accurate readings. You must follow the manual’s setup instructions or it can give inaccurate readings. Automatic blood pressure monitors come with a wide variety of features. You’ll find everything from speed pulse to irregular heartbeat indicator among the features available. Automatic blood pressure monitors are the easiest to use at home because all you have to do is turn them on to get a reading. They work best for those who need to take their blood pressure by themselves several times throughout the day. Many monitors can store blood pressure readings for up to two users. This blood pressure monitor is fully loaded with a host of useful features that make it a top pick. If you don’t want to use the extra features, easy start up and one touch readings can get a measurement in a short amount of time. Two users can record up to 100 readings each. Users particularly like the TrueRead feature that averages three consecutive readings taken one minute apart. All that information can be wirelessly synced to a smartphone for easy access by you or a physician. Easy one touch start up and use. 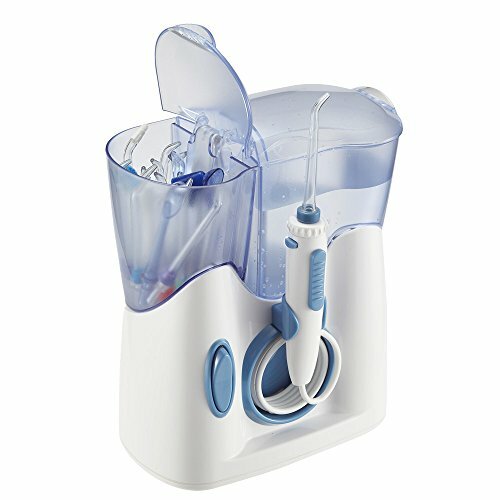 With all the extra features this monitor has, it works well for its most basic function which is taking blood pressure. With the push of a button, you get a quick reading. Impressive memory capabilities for long term health monitoring. The memory can store up to 200 results for an in-depth look at long-term blood pressure patterns. TrueRead feature averages results for you. An average blood pressure provides a more accurate view of health. The TrueRead feature takes 3 consecutive readings and averages them for you. Large, backlit digital display. The backlit display is readable in dim lighting. Viewing the number is easy with the large digital display. Memory for two users. Two users will have plenty of memory on this monitor. A physical switch, rather than a touchscreen or button, shifts from one user to another. A small percentage of units are inaccurate. A small number of users report their monitor reading the diastolic pressure 10 points higher than their doctor. The wrist cuff is smaller than an arm band, making this monitor highly portable for those who may need to check their blood pressure throughout the day. Readings are easy to see on the backlit display even in dim lighting. The display also indicates pulse, irregular heartbeat, and time of day. It can store up to 60 readings, stamping with the date and time to help look for patterns in blood pressure changes. Easy to read backlit display. The backlit display lets you check results in the dark or dim lighting. Large numbers are helpful for the visually impaired. Compact size for portability. Small enough to go in a purse or backpack without adding bulk or weight. 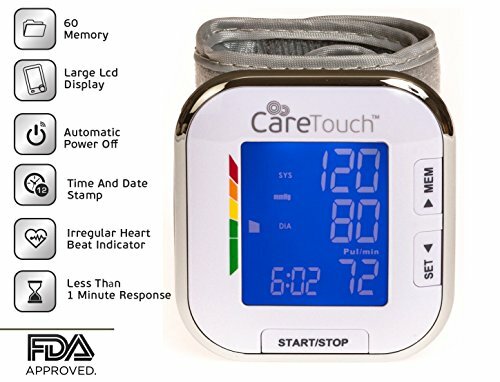 Users who need to monitor their blood pressure throughout the day like having something they can easily keep out of sight when not being used. Good memory storage stamped with date and time of day. It stores up to 60 readings with the date and time of day they were taken. This helps when looking for patterns in blood pressure changes. Quickly drains battery power. The Care Touch is run exclusively on batteries and it goes through them fast, which can get expensive. If you need to report your blood pressure to your physician, wireless blood pressure monitors can make it simple and easy. They sync with a smartphone, iPad or other wireless devices to give you easy to see readings. Information can be downloaded, saved and sent. Wireless monitors come with a higher price tag, but for those who like the convenience of seeing results in the palm of their hand or need to share results often, it can be worth the extra money. The free app included with the Greater Goods Balance is simple to set up by following the instructions on the display or in the user manual. The app provides instant access to past and current readings, making it easy to track blood pressure over time. It can also average the last three readings if needed. Two users can store and view information through the app and share results with a physician if necessary. If there are any problems with the monitor, the customer service is impeccable. They respond quickly and help with set up or any problems with the monitor's results. Usability of the free app. The free app, included with purchase, is easy to setup by following the instructions either on the monitor or from the instruction manual. You can see your blood pressure history and get an average of the last three readings. Easy access and high-quality customer service. Customer service is helpful and readily available if there are problems connecting with the app. Users found customer service to be responsive to any customer concerns or problems. Power options make it ready to use. It can be plugged in using the included AC adapter or it can run on batteries. Memory storage for two users. The app stores information for two users. Both users information is visible through the app. Accuracy problems in a small percentage of units. A few users have a unit that consistently reads 15 – 20 points high. When contacted, the manufacturer offered replacement parts in some cases or a replacement monitor. Not only is the iProven easy to setup for taking blood pressure readings, it’s also easy to connect to the free app. Many users liked that they could get started with readings right away. Those readings are then put into context on the app. It shows charts and graphs that let you see the changes and patterns in blood pressure. The arm cuff is also easy to use as it can be slid onto the arm without the help of another person. An arrow on the cuff indicates where to place it in relation to the arteries so you can get the best readings. Easy to set up both the monitor and the app. Set up is fast and simple right out of the box. Many users liked how simple and intuitive this monitor is. Fast readings put into context. This monitor takes readings in 30 – 40 seconds. The app then displays them on a graph that helps with interpretation and identifying patterns. Easy placement of the arm cuff. A long cord between the cuff and monitor makes placement easier in a number of different positions. There is also an indicator arrow on the cuff to show where you should line up the artery. Batteries run out fast. With so many extra features, it’s no surprise that this monitor quickly goes through batteries. 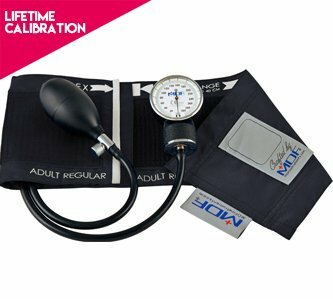 Most people are familiar with manual blood pressure monitors, sometimes called a sphygmomanometer, as this type is used by medical professionals. When used correctly, these monitors provide the most accurate and consistent readings. They are also inexpensive. However, you have to know how to use both the monitor and a stethoscope to get an accurate reading. 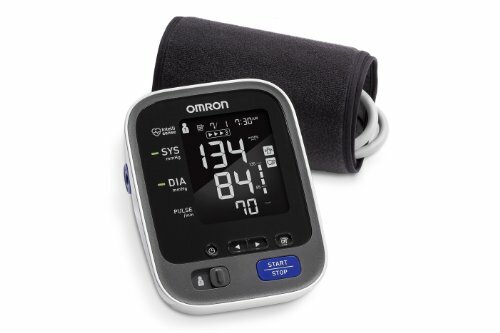 Most people need a second person to help take their blood pressure with this type of monitor. As long as you know how to use it and have the needed help, a manual monitor is an excellent choice. 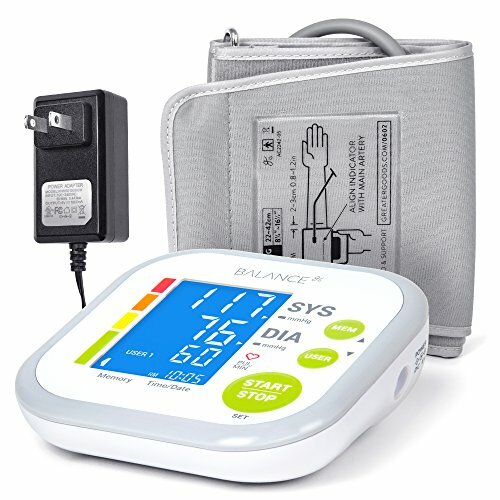 This manual blood pressure monitor has everything you need to get consistent, accurate results in a short amount of time. It inflates quickly to speed the process but also to reduce hand fatigue. The entire unit is constructed of high-quality materials for excellent durability. Many users take readings several times per day and found that they got accurate results the first time. A dial with a high contrast pattern makes it easier to view numbers while in use. You’ll also find a place to put ID information which is great for professionals who need to keep track of their equipment. Inflates quickly. Fast inflation means faster readings. Made of highly durable materials, the bladder holds out through heavy use. Accurate results every time. Provides accurate results on the first use. Many users are nurses or nursing students that take readings several times a day. Results are always reliable. High contrast dial is easy to read. The dial has a high contrast black and white design that makes taking readings fast and simple. Some assembly required. Upon arrival, the blood pressure monitor must be put together so it’s not ready to use right out of the package.